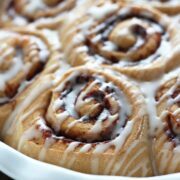 A super easy recipe for Skinny Overnight Cinnamon Rolls made lighter with less sugar, less butter, and 100% whole wheat. Enjoy without guilt! In the bowl of a stand mixer fitted with the dough hook, combine all the dough ingredients and stir until combined. Turn the mixer on medium speed and knead for 5 minutes, or until smooth. Remove the dough to a floured work surface, cover, and let rest for 10 minutes. In a small bowl combine the brown sugar, cinnamon, and salt. After the dough has rested, use a floured rolling pin to roll it out into about a 9 by 15-inch rectangle. Trim the edges. Brush all over with melted butter. Sprinkle evenly with the cinnamon sugar mixture, leaving a 1/2-inch border at the far edge. Roll the dough up, pinching with your fingers to keep it tightly rolled. Place the seam before positioning the log seam side down. Use a very sharp knife to cut off the ends then cut the dough into 12 equal pieces. Place in a greased pie pan or 9 by 13-inch baking pan. Cover and refrigerate overnight. Bake for 20 to 25 minutes minutes, or until golden brown. Let cool on a wire rack for at least 5 minutes. While the rolls cool, whisk together the icing ingredients until smooth. Drizzle all over the warm rolls and serve.